Neukölln meets New York - Atlantik-Brücke e.V. 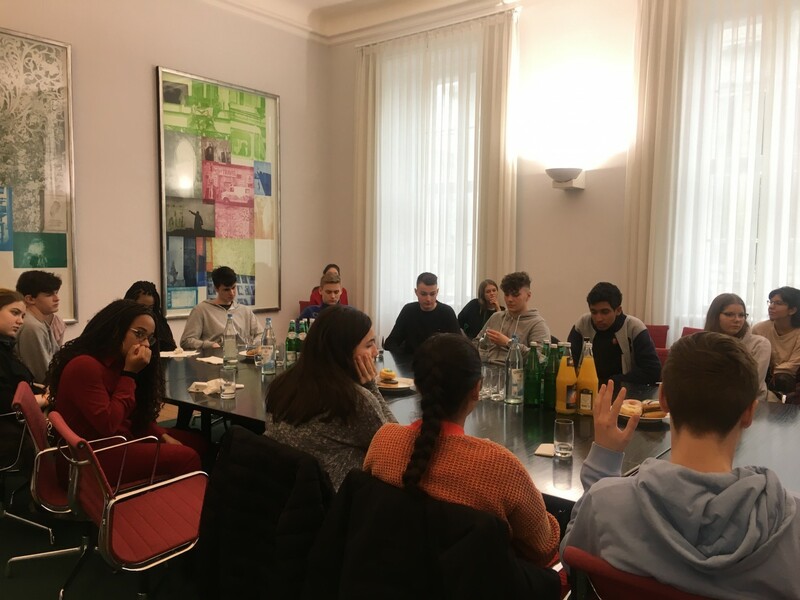 In March, Atlantik-Brücke hosted two groups of high school students – from the Hackley School in New York, and from the Fritz-Karsen-Schule in Berlin-Neukölln. The visit was initiated by Atlantik-Brücke member and Young Leader Alum Sarah Tacke, who attended the Hackley School as an exchange student. We had an insightful exchange with the students and discussed everything from gun control to fake news, identity and the American Dream. The discussion left us feeling extremely hopeful, as the students were incredibly intelligent and outspoken, but most of all, they showed a remarkable ability to debate controversial issues respectfully without alienation or polarization. It was a welcome reality check to hear what worries the next generation straight from the source: in an informal poll (along the lines of “please raise your hand if…”), we learned that the issues which worry this generation the most are economic inequality and climate change. This specific group was not so threatened by the digitalization of the job market, but that’s perhaps they are still just worried about their grades in general (their words, not ours!). After the discussion, the group from New York went on to explore Germany’s past and present. Among other places, they went to the Chancellery, took a tour of Schloss Charlottenburg and visited the Holocaust Memorial.